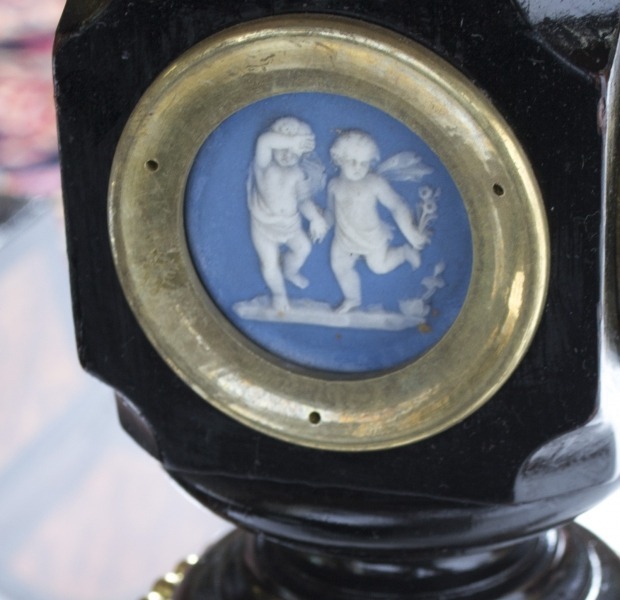 We’ve got lots of newly acquired items of Antique Furniture to show you this month – all available to view online and at our north London showrooms. 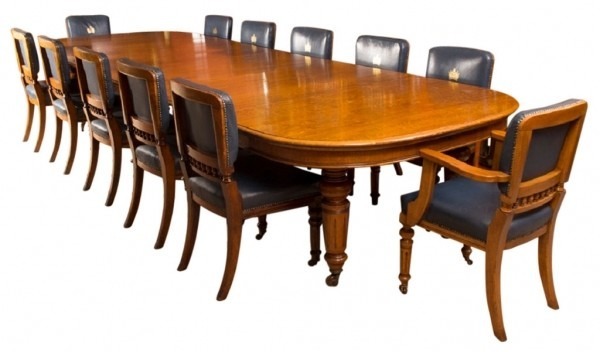 If you are looking for an antique dining table – we specialise in large dining tables – then Regent Antiques is definitely worth a visit. It is clear from its condition that this antique console table has been well looked after and we are sure that it will find another owner to continue caring for it very soon. Offered for sale at just £2550 this antique console table has been crafted from finely figured rosewood with inlaid satinwood marquetry decoration which is typical of the period – we have dated this piece to around 1830. Please note that this console table still has its original Gris St Anne marble top and is fitted with a spacious and very useful frieze drawer. 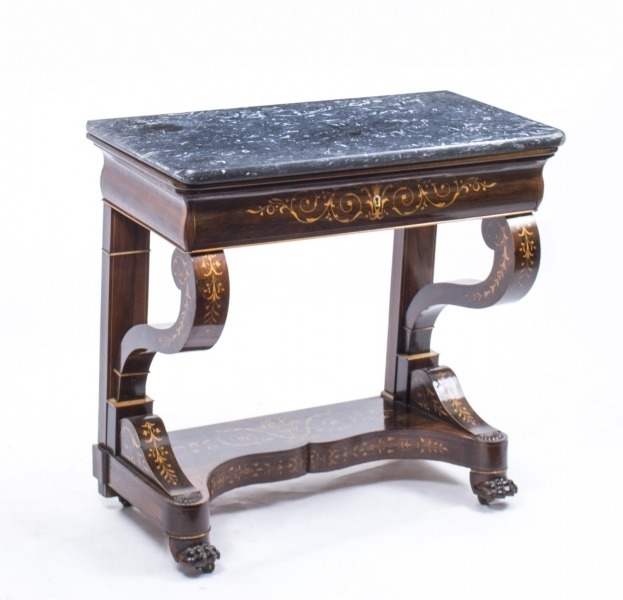 The table stands on curvaceous scrolling legs finished with beautiful lion’s paw feet. The table measures Height 80cm x Width 84cm x Depth 42cm which is equivalent to Height 2 feet, 7 inches x Width 2 feet, 9 inches x Depth 1 foot, 4 inches. The reference for this item is 07654. Next, we were very pleased to have acquired this Antique Victorian Oak Dining Table & 12 Chairs c.1870 which, as you can see from the photograph below, can accomodate up to twelve people in comfort thus making this ideal for use as a conference table, boardroom table or for use in a restaurant or hotel – or perhaps those of you who have a large family or circle of friends and love to entertain! 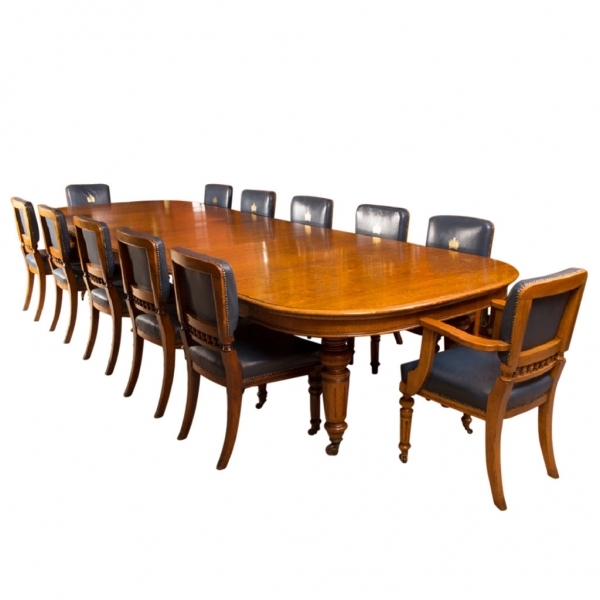 The table is supported by very sturdy turned and fluted legs that have been skillfully hand carved and which are terminated with the original brass and brown porcelain castors. The tale is supplied with a matching set of twelve solid Scottish oak dining chairs – there are ten side chairs together with a pair of armchairs. These sturdy and comfortable chairs are hand carved with fluted front legs with the original brass and brown porcelain castors. Please note that the seats and backs have been upholstered in sumptuous blue leather. The chair backs have been decorated with an attractive gilded thistle and crown motif. 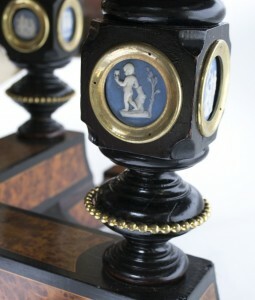 This is a rare antique English Victorian oval library table dating from around 1880 and made from ebony and burr walnut together with ormolu mounts and finished with a nice range of beautiful Wedgewood Jasperware plaques. 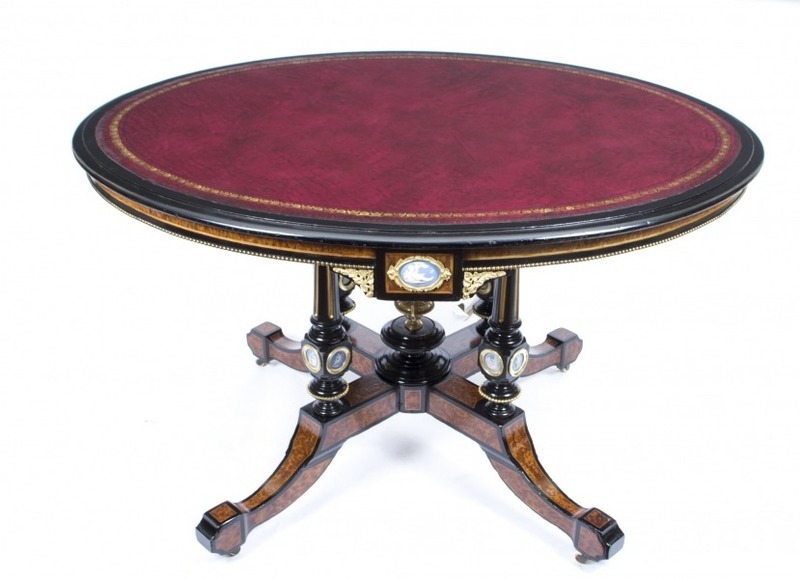 The oval shaped table top is decorated with an inset gold tooled burgundy leather writing surface together with an attractive ebonised border and the frieze is finished with burr walnut banding and four jasperware plaques which are set in attractive ormolu mounts. The table sits on four turned ebonised columns standing on a four legged cabriole base which has been decorated with boxwood stringing and burr walnut panels. The legs are terminated with original brass castors. 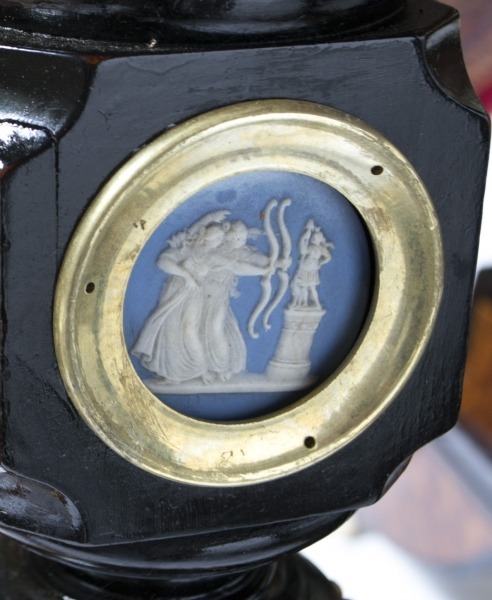 To set it all off nicely, there is a beautiful ormolu urn standing at the centre of the base which is surrounded by an impressive total of sixteen Jasperware plaques. 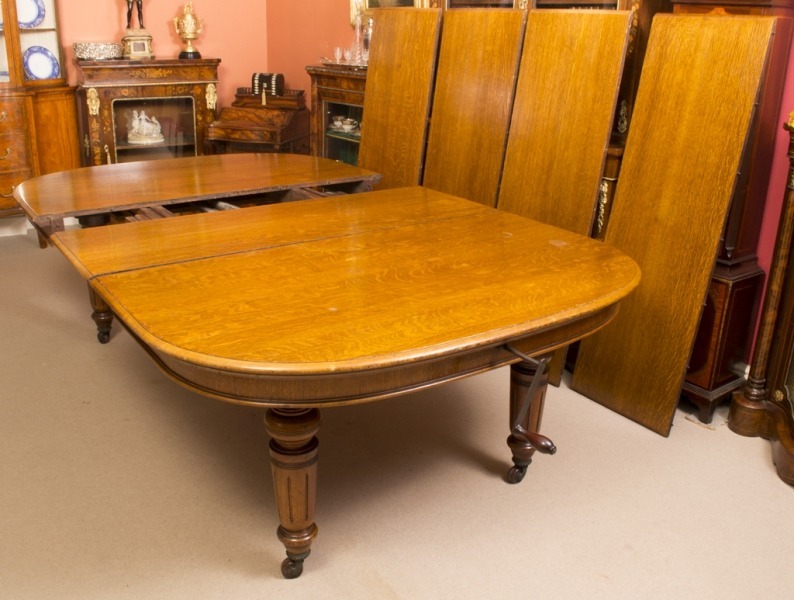 The reference number for this lovely antique library table is 07581 should you wish to contact us for more details or to answer any questions you might have. This fine table is offered for sale at just £2850. Next we bring you this Antique French Vernis Martin Vetrine Display Cabinet which dates from around 1870. Why not display your special items in this antique French Vernis Martin mahogany vetrine in the Louis XV Revival manner. This cabinet is finished with fine quality hand painted decoration as well as ormolu mounts and it also features a beautiful “Marmo di Carrara” marble top. 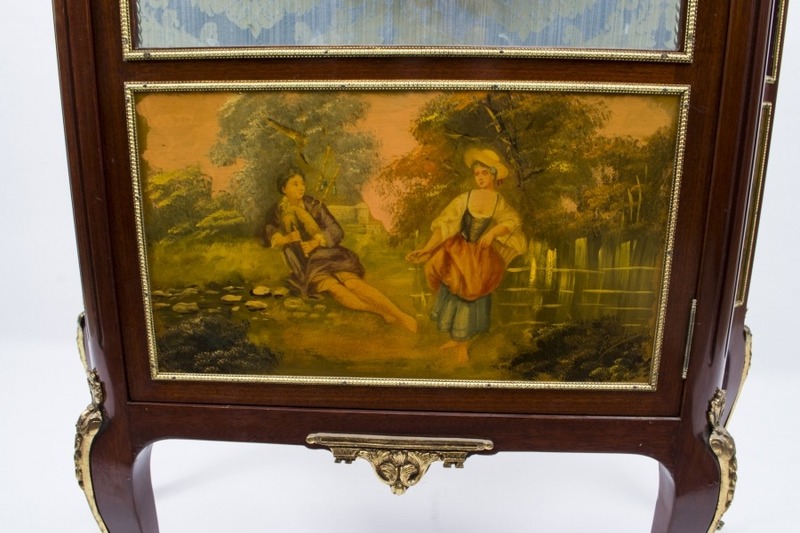 There is a central panel with a painting of a courting couple together with two side panels with paintings of countryside views. 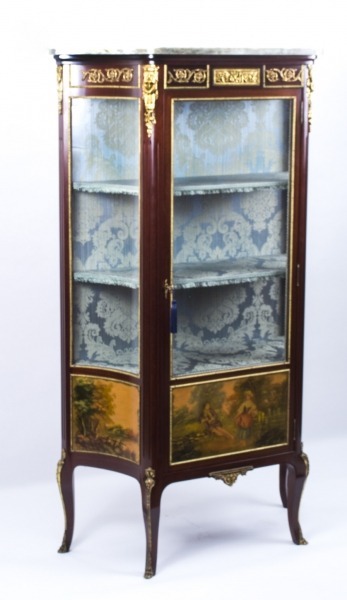 The cabinet is fitted with serpentine glass to the sides and the interior is lined in Bleu Celeste damask. The base contains a spacious cupboard. This cabinet is supplied with a working lock and the original key. This cabinet has been cleaned and polished in our workshops but no restoration work was necessary – this is a piece of furniture that has been looked after throughout its long life. The dimensions of this item are: Height 160 x Width 92 x Depth 37 which is equivalent to Height 5 feet, 3 inches x Width 3 feet, 0 inches x Depth 1 foot, 3 inches. Please check back regularly to see more of our newly listed antique furniture, collectables and decorative pieces. Our expert staff are on hand to answer your questions and advise on other aspects such as shipping.